If you haven’t heard the name Matt Szczur before you’re probably not alone. Sczcur doesn’t get the national exposure that Stanford’s Toby Gerhart and Notre Dame’s Golden Tate receive, but he deserves your attention none the less. 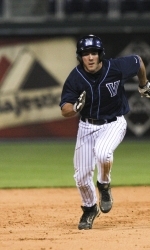 Szczur is a standout baseball and football player at Villanova and he excels at both sports. This season he was named the Colonial Athletic Association’s Offensive and Special teams Player of the Year on the gridiron, and last spring he batted .346 to lead the Wildcat baseball squad. The football team has been in the top ten in the Football Championship Subdivision for most of the season. 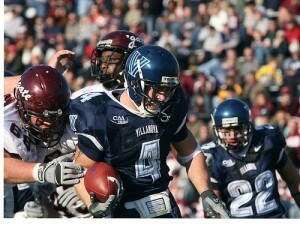 They played New Hampshire Saturday in the FCS playoff quarterfinals. That success doesn’t just happen though. Like any college athlete in any sport Szczur trains hard, but with two sports involved his training is unique and it’s almost never ending. Following is an article on Szczur’s unique training regimine written by Villanova strength and conditioning coach Stephen King. It was published in the November edition of Training & Conditioning magazine. When training any athlete, sport-specific factors are paramount: What are the major movers in their sport? What energy systems and muscle groups do they use most? Do they need to focus mainly on straight-ahead speed, change of direction, rapid acceleration, lateral movement, or all of the above? The list goes on. But what happens when an athlete is training for more than one sport at a time? At the high school level, where two- and three-sport athletes are common, training demands are generally low enough to avoid raising any major concerns. At the college level, however, developing a multi-sport athlete requires special considerations. one coherent, comprehensive training plan and carefully monitoring his progress and physical response. It poses a unique challenge for the strength and conditioning staff, but it’s one we’ve risen to meet with enthusiasm. The first step in planning an effective conditioning regimen is to perform a needs analysis and identify specific areas to focus on and improve. When working with a two-sport athlete, this process begins by looking for common threads between the sports in question. For Matt’s football roles, the keys are running speed, quick change-of-direction ability, upper-body strength to get off of “jams” from defenders, and total-body strength to help with breaking tackles. For baseball, the major movements are rotational swinging, straight-line running, and since he sometimes plays outfield, transitioning from a backpedal to a run. In all of Matt’s workouts, we keep those priorities at the forefront, looking for exercises and progressions that will maximize cross-over benefits. We test all our football athletes at the beginning of summer in the vertical jump, broad jump, squat, and bench press, and use the results as baseline numbers. The baseball players are tested when they arrive in the fall. This is important for tracking everyone’s progress in strength and conditioning, but it’s especially important for Matt, because training for two sports means a greater risk for overtraining. If we ever notice a drop off in his performance relative to his baselines, we know we need to scale back his workload and possibly make adjustments to his training regimen. I am responsible for strength and conditioning for the baseball team, and my colleague Justus Galac works primarily with the football team. We collaborate in designing Matt’s workouts, and to make this process easier on him, we decided early on to standardize as many aspects as possible. We already have very similar training philosophies, but we decided that everything from the way we taught specific lifts to the terminology we used in the weightroom should be consistent. Attention to details like these has helped Matt adapt to the demands of two teams’ training schedules, while also facilitating communication among the strength coaches and sport coaches. Matt’s yearly training cycle starts in early summer. He is among the 20 or so football players who stay in town voluntarily to train during the break. In summer, he trains five days a week: conditioning work (which includes running and movement prep) every weekday, and lifting four days. recovery. The running days typically involve series of 65-, 75-, or 80-yard runs, with the number of reps varying from 15 to 30 and the rest intervals between each rep ranging from roughly 30 to 60 seconds. The speed and agility training includes cone drills, read and react drills, and speed ladder work. On the active recovery days, the players do sub-maximal running, focusing on details such as arm mechanics. The summer lifting program is designed to help the football team build strength for the upcoming season. It consists of two days a week of upper-body lifts and two days of lower-body lifts, alternating to allow for maximum muscle recovery. The primary exercises on upper-body days include bench presses, pull-ups, and bent over rows. We always include at least one pressing movement, whether it’s a bench press, incline bench, or some other variation, but we focus more on pull movements because they develop greater shoulder stabilization and because many players are “front dominant” in their upper-body strength. We also use unilateral and prehab movements, such as band work and horizontal and vertical protraction/retraction of the scapulae, for the shoulders and rotator cuffs. Our main exercises for lower-body strength building include the front squat, deadlift, back squat, hang clean, and box jump. On max effort days the athletes will focus more on squats and deadlifts, while hang cleans and box jumps are reserved for dynamic movement days. Our lower-body workouts also feature unilateral and prehab movements, such as hip walks and ankle band work. Lifting is one area where the benefits clearly cross over into both of Matt’s sports. 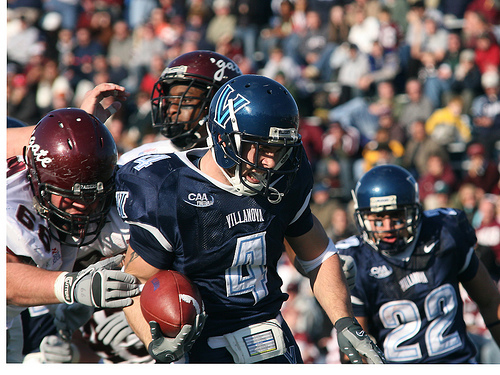 The football team’s strength regimen prepares his body to withstand the rigors and high impacts of that sport, but it also helps him recruit the muscle groups that enhance rotational acceleration and upper-body strength and control, which translates into a more powerful, consistent swing. In addition, the lower-body strength exercises aimed at increasing explosiveness and speed will help him on the base paths as much as on the football field. Many baseball players don’t have time in the summer for serious strength and conditioning, as they participate in summer leagues and often play five, six, or even seven days a week. While Matt doesn’t get that extra game experience as he works in the weightroom all summer, we believe his focus on conditioning more than makes up for the loss of baseball-specific activity and gives him a significant leg up on most of his teammates. As the summer progresses and football season gets closer, conditioning priorities shift away from basic running and agility in favor of vigorous position-specific football routines. The players start doing seven-on-seven drills and agility work that mimics their running and movement demands on the field, which for Matt means a focus on sprinting, cutting, and accelerating. He’ll run various routes, such as posts, corners, and comebacks, and do lateral shuffles and jump cuts. We also use reaction drills that involve him sprinting forward and then making a hard cut to the left or right depending on a visual cue from a coach. Meanwhile, the lifting schedule changes slightly as well: Upper-body lifting still occurs two days a week, but the football players do only one day of lower-body work in late summer, and one day a week (usually Friday) is used for strongman competitions. The strongman days include events such as tire flips, farmer’s walks, tug-of-war, and many other activities that are standard fare in football training programs. They provide total-body exercise, develop mental toughness and competitiveness, and promote team unity. They’re also a fun change of pace for the players after a week of hard training. By early fall, as the workload grows more and more football-specific, it’s especially important for me as the baseball strength and conditioning coach to evaluate Matt’s progress and ensure he’s not jeopardizing his baseball fitness by over- or under-using any muscle groups or body parts. For example, the heavy rotational demands of baseball increase the risk for repetitive stress injuries to the shoulders, hips, and knees, and all three of those areas receive heavy attention during football conditioning. To keep Matt in shape for both sports and ensure he won’t be on the verge of overuse injury by the time baseball’s preseason training arrives, I’ll supplement his football work with prehab exercises for those specific body areas. For his shoulders, I’ll prescribe band exercises with low and high external rotation, med ball work, and rotator cuff exercises. For the hips, he’ll do hip walks with a band around his ankles, foot slides on a platform, and reverse hypers while holding a ball between his legs (these last two exercises are also ideal for strengthening the groin). For the knees, we use the squat-and-touch, single-leg squats, and quarter-squat holds on one leg while touching various points on the floor with the other foot. When preseason football camp starts, lifting decreases dramatically for the entire team, Matt included. Voluntary lifting sessions are available after meetings and practices, but they typically last only 15 minutes and focus mostly on the upper body because of the pounding the lower body takes during team practice. During this time, even though Matt is lifting less, he continues with his full complement of prehab work. Once football season begins, Matt follows essentially the same regimen as everyone else on the team. After Saturday games, the players have a light full-body lifting session on Sunday that includes yoga and core work. One other lifting session during the week, usually on a Tuesday or Wednesday, focuses on the upper body and is designed primarily to maintain strength gains made over the summer. Matt continues with his prehab work at this time, but aside from that, we want him to focus solely on being a football player. He is an integral part of the team–on the field for most offensive plays–and it would be counterproductive to disrupt his physical rest and recovery during the week by adding baseball training to his schedule. His baseball teammates are in their fall lifting program during football season, hitting the weightroom three days a week to focus on total-body hypertrophy, building work capacity, and increasing strength and explosiveness, but he doesn’t attempt to join their workouts. At the end of football season, all the players get some time off (varying based on how much they played), and the strength coaches are responsible for monitoring their physical condition to catch signs of overuse or lingering injuries. For most players, it will be eight months or more until they take the field again for intercollegiate competition, so the pace of their return to training is highly flexible. But for Matt, baseball preseason is already on the horizon. You might think this would mean accelerating his return to serious strength training, but that’s not our approach. Because Matt plays positions in football that involve frequent, high-impact collisions, we’ve found that the wear and tear on his body can’t be ignored by season’s end. We want him to take at least a couple of weeks to rest and recuperate, so he won’t start lifting again until winter break. By that time, the baseball team is performing its most intense workouts of the year, having ramped up both lifting and running regimens since fall ball ended. With Matt not having lifted heavily since before football season, it’s important for him to build up his work capacity, so we’ll have him do both the baseball and football lifting routines. But we keep the lines of communication open, and he is free to tell us if he feels overwhelmed or needs to adjust his personal workload as he gradually gets back into serious lifting and conditioning. Once the spring semester starts, Matt continues participating in both teams’ workouts. The football team usually lifts three times a week (on Monday, Tuesday, and Thursday) and on Friday does mat drills–essentially an indoor version of the summer’s strongman days. Matt’s lifting sessions differ from those of the rest of the football team, as he essentially performs a hybrid of football and baseball regimens. For instance, he’ll do some of the football team’s higher rep work, including dips, hamstring curls, and certain presses, while following the baseball team’s regimen for power movements, max strength lifts, and medicine ball activities. At this time, he also joins the baseball team for batting cage work and the start of a tossing program. Baseball season begins in March, and the football team starts its spring practices soon after. This time is quite strenuous for Matt, as he is lifting, running, practicing with the baseball team, and playing in the games. We tailor his twice-weekly strength sessions at this time to address a few key priorities–power movements, lower-body strength development, and upper-body push and pull movements–and supplement that with more prehab exercises and medicine ball work. We usually have him skip the baseball team conditioning sessions at this time because he does football conditioning most days and that tends to be more strenuous. Although both the baseball and football teams follow pre-determined conditioning schedules and workout programs with set progressions, we adjust Matt’s routines every week based on his feedback and the way his body responds to training. When he feels very fatigued, we’ll scrap his normal lifting and other work for a day or more. In their place, he’ll do recovery activities like myofascial release with a foam roll, band stretches, partner stretches, and proprioceptive neuromuscular facilitation stretching focusing mostly on his legs, back, and hips. He’ll also do light circuit lifting to stimulate his muscles and give him an opportunity to rest and regenerate. This is the time of year when baseball is Matt’s top priority. Attending practices for both sports and playing in baseball games is physically taxing, so we dial down the intensity of his football spring practice participation. Specifically, he’ll do only non-contact football work at this time. After baseball season, Matt gets two to four weeks off before the cycle begins again with the start of summer break. He is typically below his football playing weight by this time because of the lower strength training demands of the baseball season, so he’s careful to take in enough calories, carbohydrates, and protein as summer strength training kicks off to support muscle growth and build himself back into football shape. Throughout the entire training year, it’s critical for a multi-sport athlete to share feedback with the strength staff about how his body feels and how he’s responding to the workout progressions. Trust is an important component of this relationship–Matt is an extremely hard worker, and we know he won’t try to get out of lifts or conditioning sessions just because he wants a day off. In fact, one of our biggest concerns at the outset was just the opposite–that he would be concerned about not shortchanging either team’s training regimen, and thus push himself too hard and risk injury. Early in his college career, we explained to him that it was better to be honest about his physical limits, recognize when he was fatigued, and skip a conditioning session or the heavier portion of a lifting day when necessary. We preach to all our athletes that the strength program is aimed at stimulation and not annihilation, and this is especially important with a highly motivated athlete juggling commitments to two sports. Another critical component of making this arrangement work is open dialogue between all the coaches involved–the strength coaches, Head Football Coach Andy Talley, Head Baseball Coach Joe Godri, and their respective staffs. Coaches have a natural inclination to not want to share their athletes, but in this case, both coaches were very receptive to the changes we made to Matt’s program. We took it upon ourselves to explain that his special hybrid strength and conditioning schedule wouldn’t neglect the needs of either sport, and because we were upfront about that, they let us create his plan and trusted us to track his progress. And of course, if the coaches had any doubts, Matt’s performance on the field took care of them. His .346 batting average led the baseball team last season, and he earned second-team all-conference honors in football after scoring eight touchdowns and registering over 1,000 all-purpose yards. Matt is a special athlete with an incredible work ethic and the determination needed to make a two-sport commitment work. With a training program that helps keep him strong, powerful, and injury-free, it has been very rewarding to see him excel in both sports.